Want a plugin version of this? Dennis Hunink has created a plugin version of this snippet available on Github. Check it out! 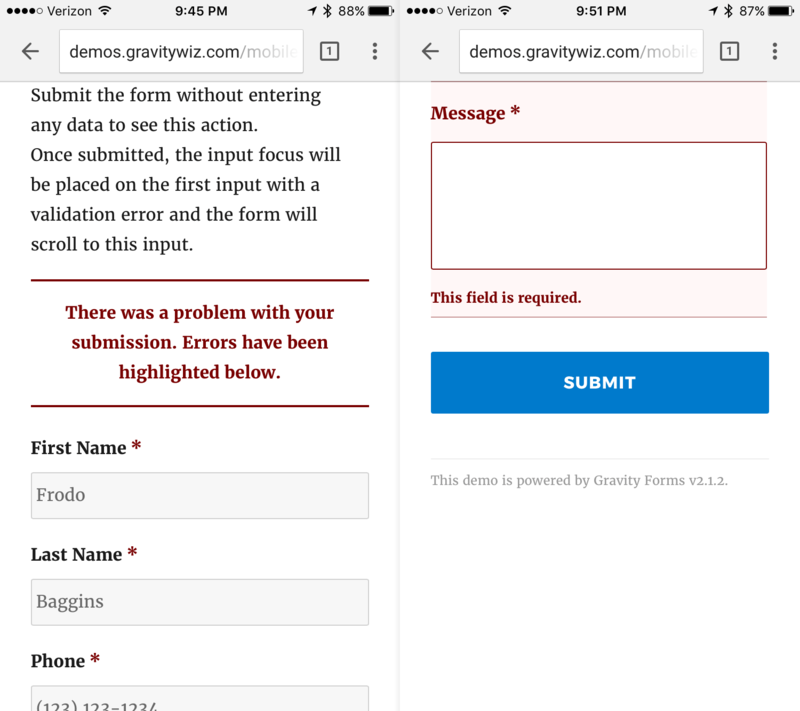 Gravity Forms validation errors are highly visible when you’re browsing the form on your laptop. You see the clear message that there are errors on the page and typically at least one of those validation errors is visible above the fold. On mobile, it’s a different story. Even for simple forms, the user can end up scrolling quite a bit to find the field with the validation error. At it’s best this can be little confusing. And at it’s worst? It can be downright frustrating. 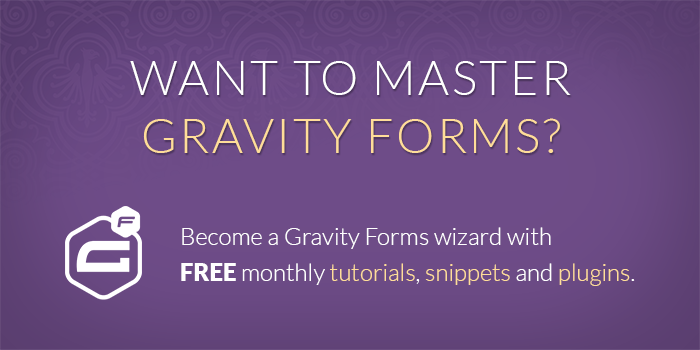 This snippet will make Gravity Forms’ validation errors just a little more mobile-friendly. Also, while we wrote this snippet to address mobile forms, this functionality will be applied to the from on Desktop browsers as well. How? This snippet will scroll the page down to the first error and give that input focus. This will allow users to immediately identify that there is a validation error and start them right at the the first field that needs their attention. Left: Default validation error. Right: Mobile-friendly focus applied to first field w/ error. Copy and paste the snippet into your theme’s functions.php. That’s it! The functionality will now be applied to all of your forms. If you’d like to limit this to a specific form, just change the filter from gform_pre_render to gform_pre_render_123, where 123 is your form ID. Let us know if this was useful to you in the comments below. Hi there! This isn’t working for me. I am testing this on my desktop. My form is located at the bottom of the page and when I submit the form – with errors – it takes me to the top of the page so I can’t see the error message. Any suggestions? Hi Carol, I confirmed the demo is working as expected. I’d confirm that the snippet was installed correctly. If you’re a Gravity Perks customer, we’ll be happy to provide additional support via the support form. Thank you for your response David. 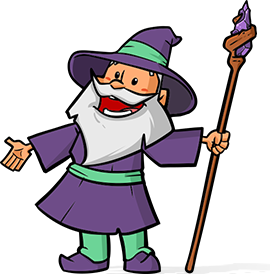 I understand your demo is working, however it is the only item on the page and it is a short form, so it is difficult to test whether the script is working in a situation where the form is long and positioned lower on the page. This functions.php life is located in my child theme. I even tested it by adding the code in the theme’s functions.php file and it still isn’t working properly. Is it possible for you to test the form on my page to see what I am experiencing — or could you lengthen your demo so that I can see how it will work in my situation? I appreciate your help. Thank you very much! Didn’t work for me. :-( Too bad. Maybe it’s not compatible with WP 4.9.6. I’m using a child theme and added the snippet to my child theme functions.php. Tried all the troubleshooting tips, but no go. Thanks anyways. Is the demo working for you? Hi, I have tried above code, its working fine in desktop version, but not working in mobiles(ios and android). In mobiles while clicking on the submit(in gravity forms) button, the page is scrolling up, user thinks that form is submitted but not. Any help on this please. Hi Madhu, if you’re a Gravity Perks customer, we’ll be happy to provide additional support via the support form. Thank you very much for your prompt reply. I did another test going through all fields. All are okay except for the CAPTCHA. Do you have an email so that I can send you my details for you to check. It works great. The only issue is when the user does not fill in the CAPTCHA right at the bottom the form scrolls right to the top. Hi Tony, I tried to recreate this locally but it worked as expected for me. The form scrolled down to the failed captcha. Hm, demo is working for me. Just wondering if there’s a way to control the page anchor more specifically. On desktop it jumps to below the form itself so might still prove a little confusing. Hm, I’m not seeing this behavior, Tim. Would you mind doing a little screenrecording so I can see what you’re seeing?